The cost of making your company safer can be high, but the costs of not doing so can be much, much higher. Is Investing In Safety Worth The Cost? Although you may not realize it, we’re living in a revolutionary time. Society is being transformed by an ever-increasing demand for, and consumption of, vast amounts of data. Much of this data is the result of a measurement or metric of some kind, and we’re just beginning to discover all the ways in which this data can be analyzed to explain the previously inexplicable. In fact, the more information we collect from the world around us, the more it’s beginning to appear that almost anything can be understood and quantified—even abstract human ideas—if enough measurements are taken. Is the same true for safety? Can an intangible concept such as safety be measured? And if so, in what ways? The contributing writers in this issue of The SafetyNET magazine have examined these questions from a number of intriguing angles. In “Shifting Gears” (p.16), Dr. Randy Flemmer explores ways in which driver safety can be measured; while Ted Lane’s article, “Is Investing In Safety Worth The Cost?” (p.26) offers a fascinating example of how the costs of safety can be quantified. Emily Ortis delves into the technical side of safety metrics with “Leading and Lagging Indicators” (p.12), and Shawn Robertson shares his personal experiences while explaining how to improve objectivity in “Validating Competency” (p.8). Susan Sawatzky’s “The Thief In Plain Sight” (p.19) uncovers a mysterious, yet all-too-obvious risk factor for your business. And in “Game Time” (p.22), Sharayah Piercey points out that no amount of safety measurement will be effective unless your team has a targeted game plan. We truly are living in a revolutionary time—a time that offers unparalleled opportunities and new horizons in terms of measuring the success or failure of your company’s safety training. How will you and your company apply data and metrics to enhance safety in your operations? 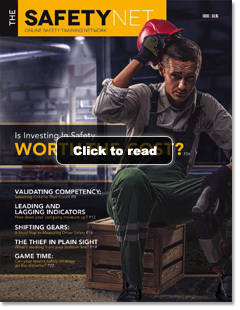 I hope you’ll enjoy finding out the answer in this issue of The SafetyNET.